If you are looking for a great salad for a party or BBQ, then look no further as this recipe just rocks. I have loved many Asian style noodle salads, usually made with glass noodles and love em! This with the spaghetti, I wasn’t sure about, but it works and it works a treat! The grill evenings and parties my wife and I throw, have over the years become an event that not too many people turn down. From the first few parties I went to with one exception and that was a party hosted by my wife’s cousin with his Filipino wife and her friends. The others it seemed all hosted the same food. The noodle salad, the potato salad and other bits, they were all the same and tasted the same. People grilled bratwurst and pork steaks, which don’t get me wrong tasted great, but when you see this all the time it gets mundane! I started knocking up for parties things like chicken satay with peanut sauce, teriyaki wings, hot wings, honey garlic ribs, deep fried fish balls, sushi and the list goes on and the same applies to our grill parties and in fact when my in-laws host grill parties They throw me some Euros and say you get the food together. So nowadays not just us but the in-lawas parties too, have happy guests trying out food they would never had thought of doing themselves. Our couscous and ceasar salads are now legendary!! Anyway, the last big grill party was my birthday, which I shared with my youngest boy and I decided to grill a feast of sausage. I discovered that one of my friends here is an absolute sausage lover and he especially enjoyed the English sausages I had imported. Yes, you see Germans don’t think anyone can make sausage like them. Anyway, we needed a new salad and we were watching Ina Garten, the Barefoot Contessa a few days before and she made what looked like an awesome noodle salad. So we gave it a try and it was a hit. This salad is easy to make and you should definitely give it a try! Boil up a large pot of salted water then add the spaghetti and cook until soft. Drain and set aside. For the dressing, whisk together the vegetable oil, rice wine vinegar, soy sauce, sesame oil, honey, garlic, ginger, chillies, 2 tablespoons of the sesame seeds and the peanut butter in a bowl. 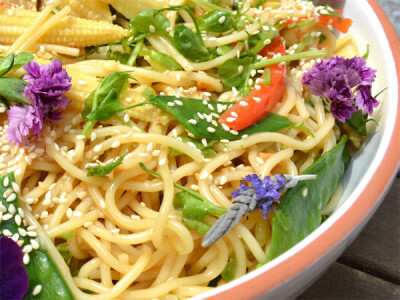 Mix together the spaghetti, sugar snap peas or mangetout, baby corn, peppers and spring onions in a large bowl. Pour on the dressing then sprinkle the remaining sesame seeds over the top and add most of the chopped coriander and toss together. Remove to a nice clean serving bowl and sprinkle the remaining coriander leaves over top.